In Indianapolis, Labor Day means only one thing, and that’s the Chevrolet Performance U.S. Nationals. 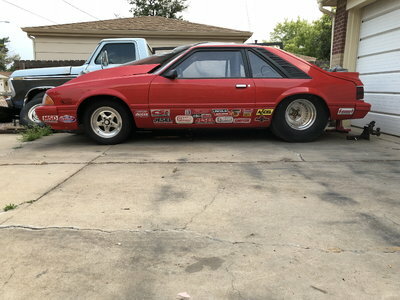 It’s the one drag race that can change a career and make a season, and for 62 years it has been NHRA’s most prestigious race; with the biggest purse and points and a half, there’s a reason it’s called ‘The Big Go’. Everyone wants to win it. 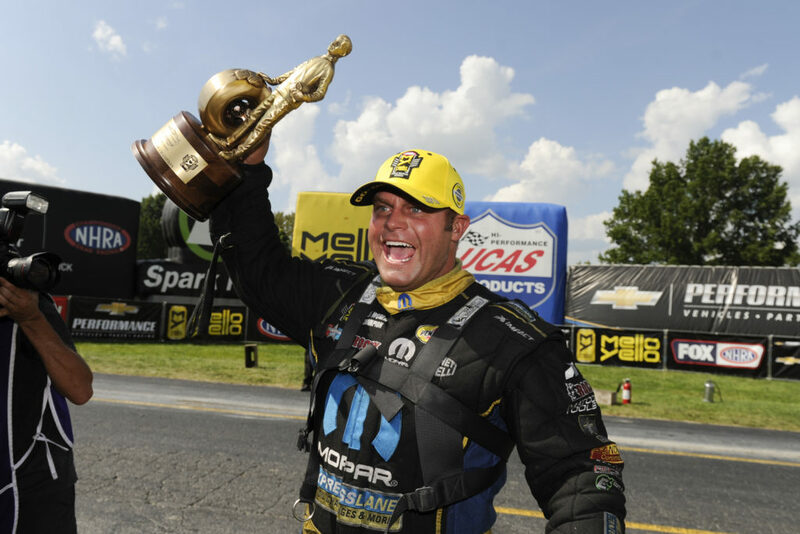 Top Fuel’s Tony Schumacher set the record, making 10 wins at the Nationals in a career that began on the same track 20 years earlier to the day. Matt Hagan just beat down his Funny Car opponents on the starting line and on the track with runs that no other team could match. 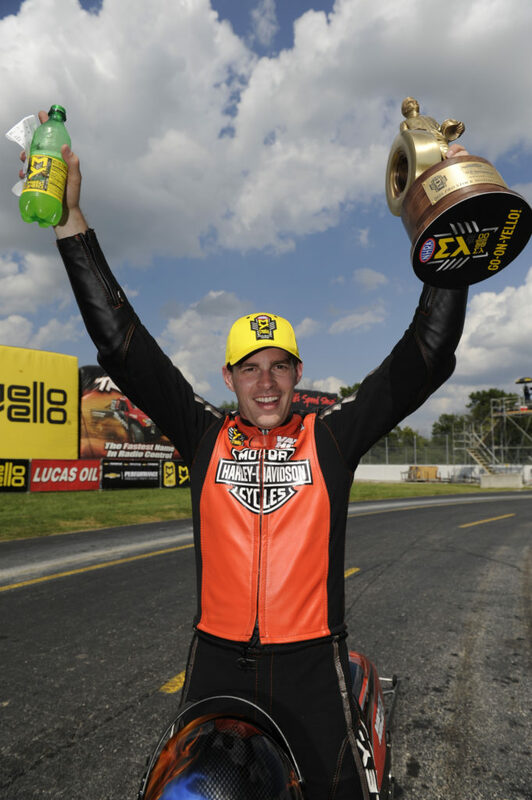 Chris McGaha made his Pro Stock debut five years ago at Indy, and now he’s a U.S. Nationals champion and Pro Stock Motorcycle winner. Andrew Hines rode his Harley to victory for his second Indy win. 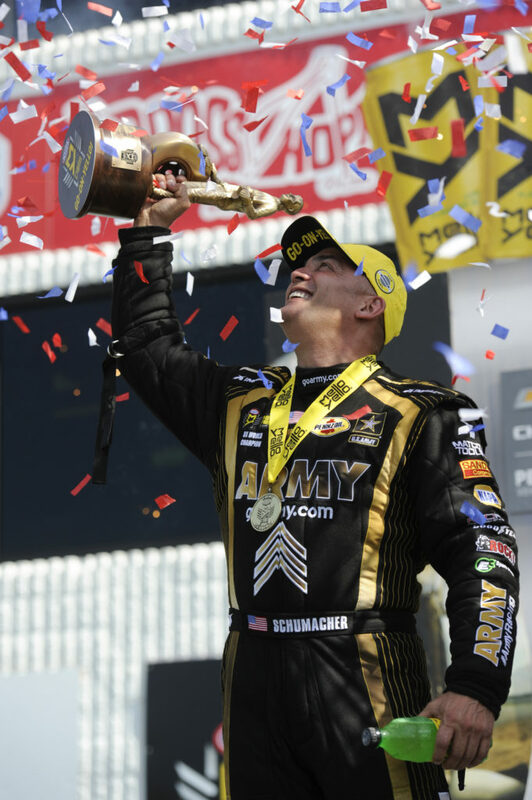 The U.S. Army Top Fuel team of Tony Schumacher came into Indy’s U.S. Nationals on a mission to win it all, and that’s exactly what they did. On Saturday, Schumacher defeated his teammate Leah Pritchett to win the Traxxas Shootout for $100,000, and on Monday he riddled the field, taking down Tripp Tatum, Antron Brown, and J.R. Todd. In the finals he slipped by on a small holeshot over three-time consecutive runner up at the Nationals, Steve Torrence. Earlier in the day, Schumacher’s team, led by Mike Green, put down a couple of great 3.70’s – and in the heat of the day, with a track temperature of 126 degrees. 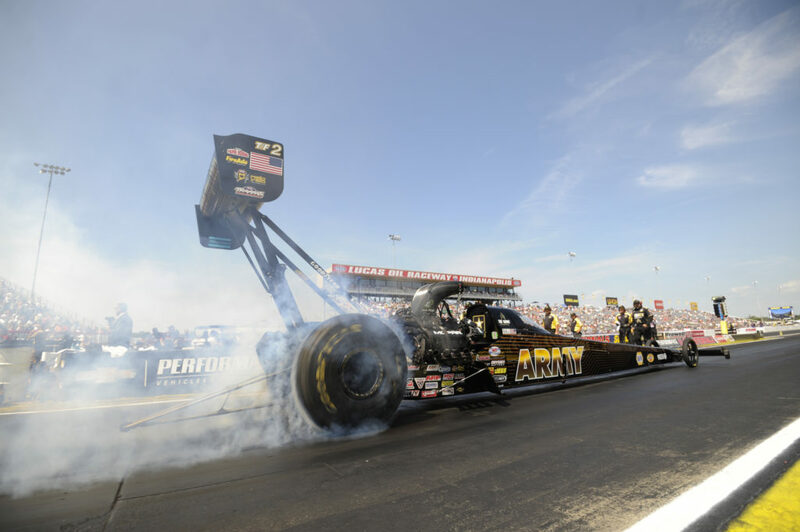 He left first to run a time of 3.806 seconds, 317.64 mph to Torrence’s slightly quicker time of 3.803 seconds, 325.06 mph in taking his category leading 82nd career Top Fuel win. In another record, his 10th career Indy victory broke the tie with Pro Stock’s Bob Glidden of nearby Whiteland, Indiana. He is now the winningest driver at the Lucas Oil Raceway at Indianapolis out right. It was Torrence’s third straight U.S. Nationals finals without a win and again will leave Indy shaking his head, wondering what else he needs to do. Now the Countdown starts in two weeks in Charlotte. 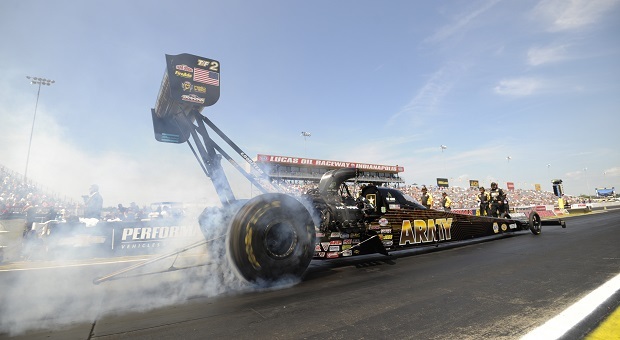 Leah Pritchett qualified for Monday’s championship eliminations in the 10th spot to earn two bonus points, while McMillen was 16th and only earned one point. Both lost the first round, locking her into the Countdown, much to her relief. Antron Brown will have the 30-point lead over Doug Kalitta with Steve Torrence, Schumacher, and Brittany Force making up the Top 5. 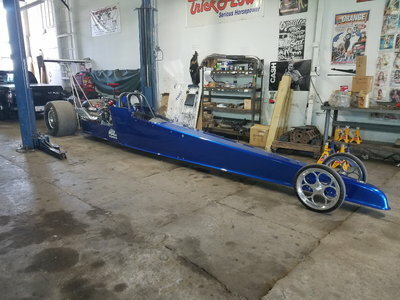 Last week at Lucas Oil Raceway near Indianapolis, Matt Hagan’s crew chief Dickie Venables unloaded a new Dodge Charger R/T Funny Car chassis at the NHRA test. 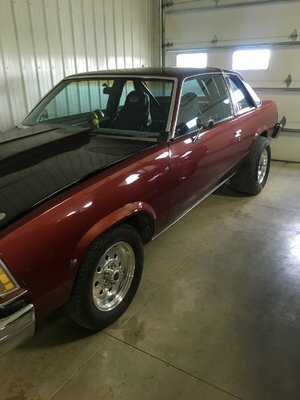 After only a couple of laps down the track he felt they were good to go, and packed it up to head back to Don Schumacher Racing headquarters right down the street. Venables entered Monday’s U.S. Nationals tuning Hagan to his first U.S. Nationals title with four sub-4-second runs in the hottest conditions of the weekend after securing the No. 1 qualifying spot on Friday night, clinching his 21st Funny Car national event win on Monday. 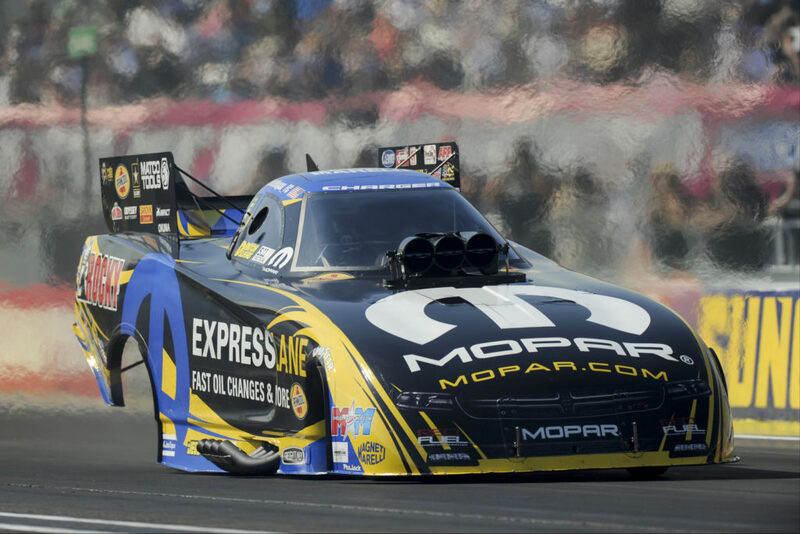 He sailed through eliminations, defeating John Bojec, Robert Hight, his DSR teammate, Tommy Johnson, Jr. and in the finals, defending Funny Car champion, Del Worsham. 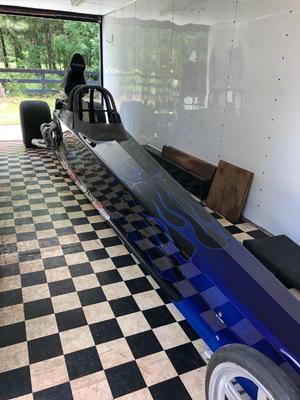 Hagan had low elapsed time in each of the first three rounds, but in the final, it was a mind-blowing .039-second reaction time that did the trick. Del Worsham’s quicker time of 3.958 seconds, 324.20 mph wasn’t quite enough for Hagan’s pass of 3.964 seconds, 327.43 mph. Heading into the Countdown, Ron Capps will lead the way with a 30-point advantage over Del Worsham, Hagan, Courtney Force and Jack Beckman. Alexis DeJoria sealed her deal holding onto 10th place after Chad Head was defeated in the quarterfinals. In the NHRA Traxxas Shootout on Sunday, it found Courtney Force winning her first special event race and $100,000 from her own sponsor of her John Force Racing Chevrolet, defeating her teammate Robert Hight in the finals. 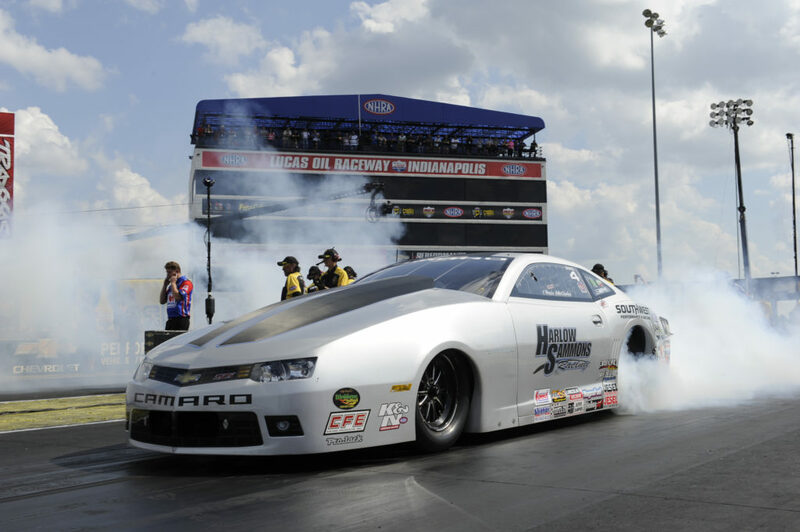 What an incredible weekend for Pro Stock driver Chris McGaha. He raced his way straight to the winner circle at Indy, defeating Matt Hartford, Curt Steinbach, Vincent Nobile and Allen Johnson on race day. 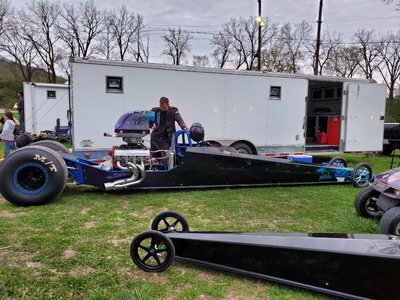 As the tree came down, McGaha let off the clutch with a .020-second reaction time – giving him .024-second advantage over Johnson, who came into this round with lane choice. 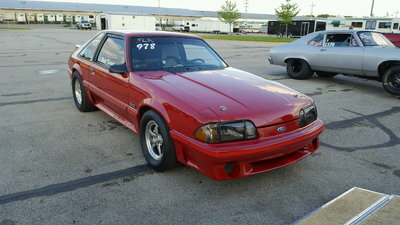 McGaha hit every shift as he traveled down Lucas Oil Raceway and as they reached the finish line, McGaha could see the front end of his Chevrolet Camaro was ahead of Johnson. McGaha clocked in with a time of 6.688 seconds, 207.15 mph and edged out Johnson’s 6.715, 207.08 to take the win. 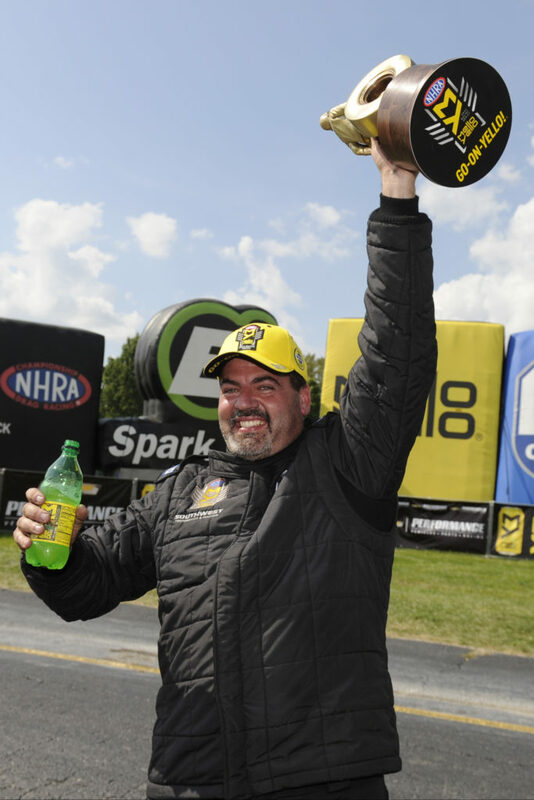 McGaha came into this weekend with no round wins at Indy and on his fifth anniversary, he did what every racer in the NHRA dreams of doing; winning the Big Go. Jason Line leads Greg Anderson, Bo Butner, Allen Johnson and a red-hot Vincent Nobile into the Pro Stock Countdown that starts in two weeks at zMAX Dragway in Charlotte. In the makeup rain delayed August Pro Stock finals from Seattle, it took Vincent Nobile just a thousandth (.001) of a second to red light, giving Aaron Strong his first ever Pro Stock victory. Andrew Hines took over the Pro Stock Motorcycle points lead by riding his Vance & Hines Harley-Davidson to a 6.682-second pass at 194.63 mph in the final round to beat Hector Arana Jr., who red lighted on his Buell. He earned his 47th career win, fifth of the 2016 season and second at Lucas Oil Raceway with the effort. The winningest Pro Stock Motorcycle racer in NHRA history beat rookie Melissa Surber, alligator farmer Jerry Savoie and Sonoma winner LE Tonglet in the earlier rounds. 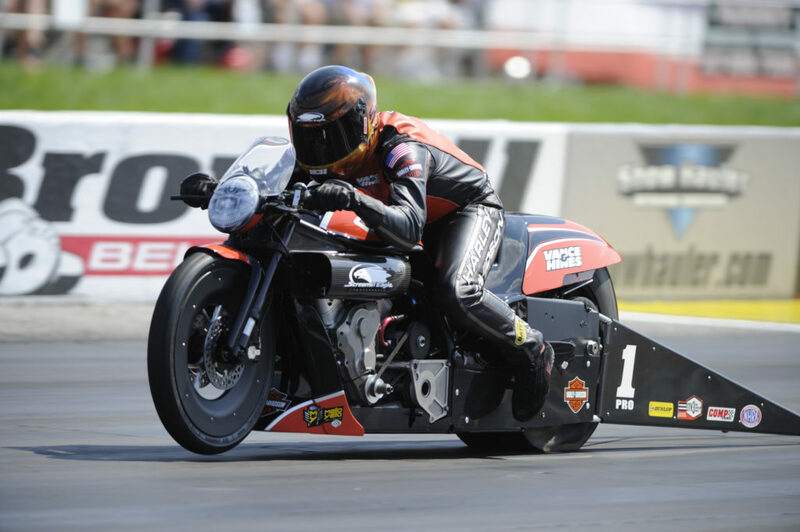 Following the leader Hines is his Harley teammate, Eddie Krawiec, Angelle Sampey, Jerry Savoie and LE Tonglet rounding out the top five in the two-wheel Countdown. Tonglet, Chip Ellis, Hector Arana Sr., Matt Smith and Cory Reed all clinched spots into the Mello Yello Countdown to the Championship. The 2016 NHRA Mello Yello Drag Racing Series will continue with the NHRA Carolina Nationals, Sept. 16-18, at zMAX Dragway in Concord, N.C. 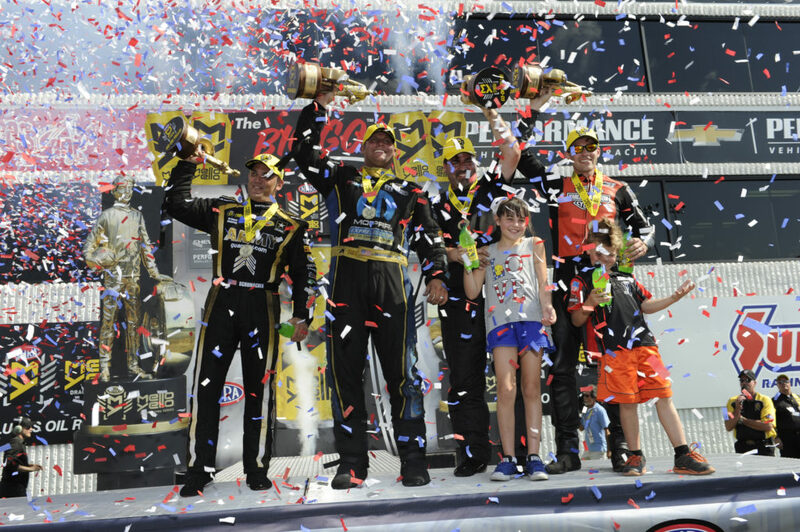 The event is the first race of the six-race NHRA Mello Yello Countdown to the Championship playoffs.